Walnut table leg sample made using a combination of CNC milling and hand-carving techniques to reveal the 'ghost' of a Queen Anne table cut within the square body of the leg. 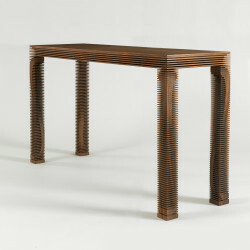 Originally made by hand on a small bench saw, the subsequent pieces were CNC milled and then chipped away by hand. Gifted to Crafts Council by the maker. 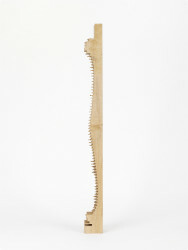 'Anne' Table Leg Sample, Gareth Neal, 2007, © Gareth Neal, Crafts Council Collection: HC1070. Photo: Stokes Photo Ltd. Contained within this contemporary rectilinear American Walnut side table, is the ghost of its past, a 1730 Queen Anne side table. The Queen Anne period was the first chapter in design within English furniture. This table aims to promote, design, educate and stimulate the imagination. The table’s design is subtle, only in certain lights and at various angles is the idea evident. Originally made by hand on a small bench saw this table promotes craft and skills of the hand made. Proof that great expenses on application such as cnc are not required for prototypes, just time and patience. This American Walnut table was designed as a limited edition by Gareth Neal in January 2007 for Collect at the Victoria & Albert museum and was made to promote more commercial ideas and the bespoke. In this ever growing world of mass production the need for individuality is primary within our lives to feel special, not one of the sheep trapped by advertising and marketing power. This was the first in my series of rectilinear cut furniture pieces that gained my practice attention, helping to establish it within the bespoke design / craft / art sphere.